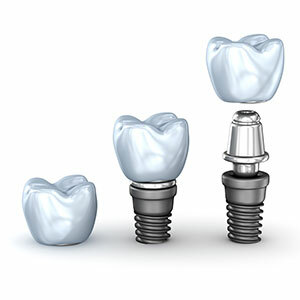 Dental implants are uniquely designed to look, feel and function similar to a natural tooth. We use them alone or in pairs to replace missing teeth, as they’re stable enough to support anything from a single porcelain crown to a bridge or full mouth denture. We’re proud to have a team of dentists trained in implant surgery, so that our patients can complete both their placement and restorative phases in our practice. This comprehensive approach to care limits the need to refer you to other offices, making your experience convenient and more affordable. The ideal candidate for dental implants will have healthy gums and dense bone structure through the jaw. Occasionally some people will need to have a bone graft or other type of supportive surgery before an implant can be installed. If you currently smoke or use tobacco, you may not be able to have implants (a very healthy environment is necessary in order for implants to fuse into the bone properly). After implants are installed, new bone fuses with the artificial roots in a way that permanently secures them into the mouth; we call this process “osseointegration”. There’s no commitment required. Find out if you’re a candidate for implants — or if they’re right for you — by scheduling a complementary evaluation with our team. Be sure to ask about our affordable financing options. Contact us today to learn more!